Public power utilities must learn quickly as they manage through these changes in technology, regulation, and operating models. What are the four strategic priorities that should be on every CEO’s short-list? View this report to find out. Companies such as Starbucks are realizing that building out a sustainable supply chain is critical to achieving meaningful impact on their goals. This Clean Tech & Sustainability Minute highlights the first corporate sustainability bonds issued in the U.S. In the business world, sustainability is defined as a focus on the “triple bottom line”—managing environmental, social, and economic risks and opportunities. Striking the right balance between these three aspects is the main challenge of enterprise sustainability and the main focus of sustainability reporting efforts. A group of major U.S. corporations has issued a set of "buyers’ principles" aimed at improving access to a broader range of options for lower cost renewable energy resources. Learn about the key details and implications in this Clean Tech Minute. This article is the second in a four-part series focused on strategic priorities for public power. For leaders looking for an opportunity to position their utility for better financial performance and operational success, few initiatives resonate more than sustainability. Companies across a variety of sectors are starting to challenge their staff to incorporate sustainability into the many facets of their organizations. But how can you assess the potential impact of integrating sustainability and any resulting benefits within your company? Utility leaders today are faced with a number of priorities, from solving issues with aging infrastructure to dealing with cybersecurity threats. In the face of these challenges, sustainability presents a unique opportunity to get ahead by improving the long-term health of your organization. For many public power utilities, sustainability provides a framework for bringing together the various elements of their mission of environmental stewardship coupled with social and economic development. Realizing this begins with understanding the broad definition of sustainability as it pertains to public power utilities and developing a blueprint for sustainability-driven organizational transformation. However, as the industry continues to examine how sustainability can impact an organization and its customers, the definition has expanded beyond just environmental concerns. Sustainability now encompasses a three-fold mission, which includes focus areas for social and economic impacts alongside the traditional environmental focus. 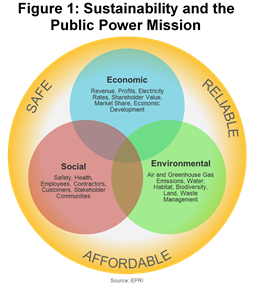 In conjunction with this three-fold sustainability mission, a recent study conducted by the Electric Power Research Institute (EPRI) identified specific sustainability-related areas of concern for utilities within the broader context of their operating mission of providing safe, reliable, and affordable power (shown in Figure 1). The results of the study, which focused on 15 critical topics of interest across all three areas of sustainability, highlight how public power companies are facing many of the same key sustainability issues as the rest of the power industry. In conducting their research, EPRI involved large public power entities such as TVA, NYPA, and NPPD to gather feedback from surveys focused on issues that have the potential to impact the long-term viability of electric utilities and their stakeholders. The study revealed that a number of utilities have created an environmental agenda that emphasizes such topics as greenhouse gas emissions and climate change, the reduction of other air emissions, water quality and availability, waste management (including coal combustion residuals), and habitat protection and biodiversity. Many concerns raised by these environmental topics are colored by the additional sensitivity of public power entities to the potential economic impacts of new environmental regulations on the rising cost of electricity, as well as the need to balance environmental considerations with their economic development mandate. While these concerns are shared by all electricity providers, the unique connections between public power entities and their local communities heighten the need for carefully balancing the economic and social components of sustainability with the resource requirements posed by furthering environmental commitments. Importantly, results from the EPRI survey highlighted a number of items beyond more “traditional” environmental concerns. In particular, the social aspect of sustainability was very visible, with utilities focusing on topics such as public safety and health, deficit of skilled workforce, community support, increased stakeholder engagement, and economic development considerations. With the creation and expansion of the societal sustainability agenda, many public power utilities have moved to reduce their carbon footprint, either by integrating new technologies with their existing generation or by developing, procuring, or constructing renewable generation. However, despite measurable progress, utilities can find themselves on the wrong side of public opinion, particularly around the sector’s contribution to climate change. Due to their widespread environmental and social impacts, utilities are often regarded as entities that require a “social license to operate.” The social license is defined as the level of acceptance or approval granted to an organization by stakeholders in the local community. It is a dynamic, intangible measure of the perceptions and opinions of the population that is directly impacted by the existence of the utility. In its simplest form, a social license to operate will consist of a basic acceptance by the local community of the company in question. Most companies, however, will see greater benefits in the long run if they can attain a higher level of social approval, a level associated with having advocates and collaborative community members. In the electric utility industry, the term “license to operate” has been historically used to describe the rigorous set of approaches used by nuclear fleet operators. For a long time, nuclear operators have recognized their obligations to demonstrate their “license to operate” beyond basic regulatory compliance. Other players across the entire utility industry, including public power entities, are now being held by stakeholder groups to higher standards of corporate responsibility. When applied to sustainability-related issues, social license to operate can require unprecedented levels of legitimacy, credibility, and trust between public power entities and their stakeholders. The existing connection between public power utilities and their local communities provides an excellent foundation from which to further conversations around social license. However, striking the right balance around social, economic, and environmental concerns will be the biggest challenge to public power’s ability to meet growing stakeholder expectations. The broad spectrum of sustainability issues and the lack of a common definition of what, specifically, “sustainability” means in the context of utilities has further complicated the task of leaders who must develop a strategy that aligns sustainability goals with organizational goals. This reality has evolved as sustainability has transitioned from a fringe initiative to a more mature and accepted approach to conducting business. When sustainability strategies stand apart from core business strategies, gaining support for your vision from your current organization can be difficult. The complexity and multi-departmental nature of sustainability issues requires a new, iterative and more dynamic approach to organizational development. Development, integration, and adoption of a sustainability strategy require significant changes in the organizational mindset and create an opportunity to rethink not only organizational approaches to sustainability but also the company’s operating model and long-term objectives. Providing visibility to your effort through reporting and communication demonstrates the commitment of the organization to achieving the stated objectives. An appropriate level of oversight and engagement will accelerate the pace of adoption for your new organization while ensuring that the sustainability strategy and execution continue to evolve. Similar to other electric utilities, public power companies are facing heightening societal expectations to go beyond the basic initiatives of the past by fully integrating sustainability into their strategy and operations. To accomplish such integration, sustainability needs to be addressed as an enterprise-wide initiative impacting both CEO agenda and the day-to-day processes, policies, and procedures. 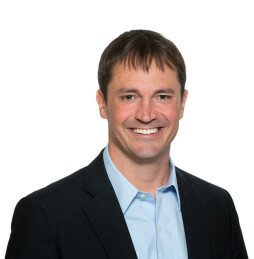 Due to their unique mandate of environmental stewardship coupled with social and economic development, public power is uniquely positioned to be an industry leader in sustainability-driven organizational transformation.